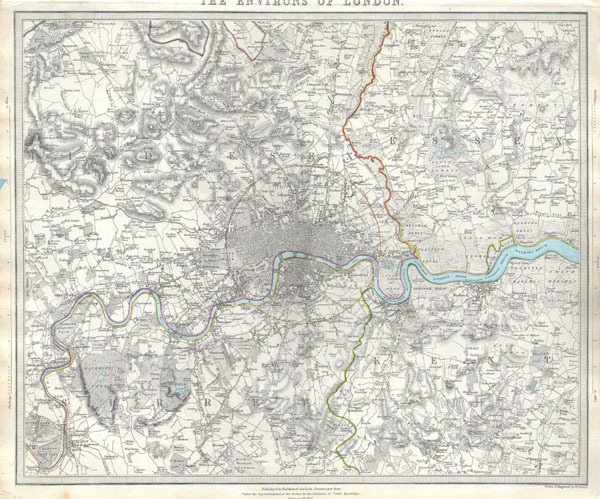 A difficult to find map of the vicinity of London, England. Depicts the London area from Kingston and Hamton Court Park in the southwest to Stanmore in the northwest, Hennault Forest in the northeast and St. Marys Cray and Kevingtown in the southeast. A red circle around central London indicates the 'Extent of twopenny post delivery.' Crisp detail notes individual buildings, factories, kilns, butchers, farms, palaces, etc. Printed by Baldwin & Cradock of Paternoster Row, London, for the Society of for the Diffusion of Useful Knowledge on February 1st 1832. Maps of the Society for the Diffusion of Useful Knowledge. Vol 1. 1844. Very good condition. Part of title cropped from upper margin, as is common with this particular map. Minor discoloration to left margin, does not extend into printed area.